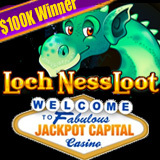 A retired air force member has racked up over $100,000 in winnings playing the new Loch Ness Loot slots game at Jackpot Capital Casino. The other day he won the first big jackpot on the new game putting his total winnings on the game well over $100,000. Steve N., 47, married with two kids, thought he was just going to have his usual bit of fun playing slots the other night when he got lucky playing the newest game at JackpotCapital.eu. "I thought it was just going to be a regular Friday night,” Steve told the customer service rep at Jackpot Capital. “I just wanted to try out this new slot. Boy, was I in for a big surprise!" After depositing $65 using a 100% VIP deposit bonus, Steve played exactly 444 games on the new casino game when he won about $1000 on one of the its two random jackpots. To date, Steve has won $109,683.53 on Loch Ness Loot alone. He’s also won $11,025 on the London Inspector slot. Jackpot Capital has more than 300 games from Real Time Gaming (RTG) including million dollar progressive jackpots such as Jackpot Piñatas, Caribbean Hold´em, Mid-Life Crisis, Shopping Spree and Aztec’s Millions. The online casino is popular around the world and is well known for its easy deposits and withdrawals. Casino staff stay in touch with players on the casino’s Facebook page.